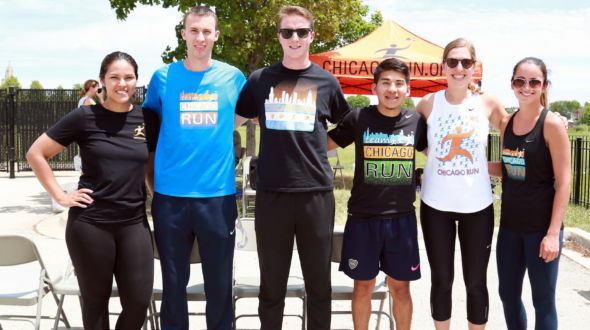 Urban Initiatives – Collaboration and Play at Prieto Field Day! 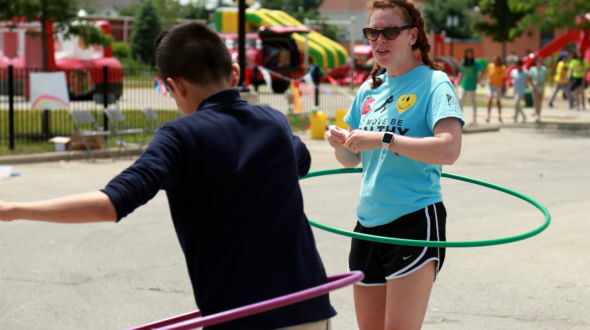 Collaboration and Play at Prieto Field Day! In the days leading up to summer break, schools wrap up with academics and put the books away a day or two early. Schools relax and everyone (teachers and kids alike) takes some time to enjoy each other’s company. Community organizations are part of this as well. We work together to support students as they learn, grow, and succeed, and even though we know that learning never stops, we love a chance to give students one final high five for the school year. 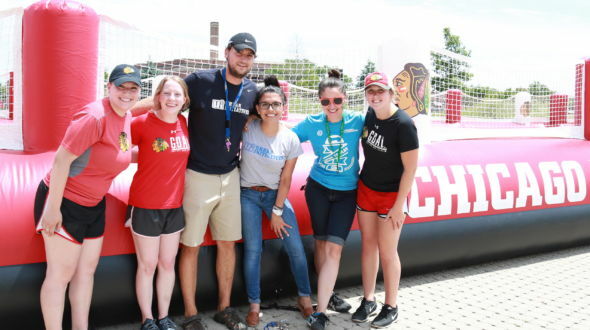 This year, sports-based youth development partners from the Chicago Blackhawks, Chicago Run, Girls in the Game, and Urban Initiatives convened at Prieto school to celebrate the end of year field day with fun physical activity. 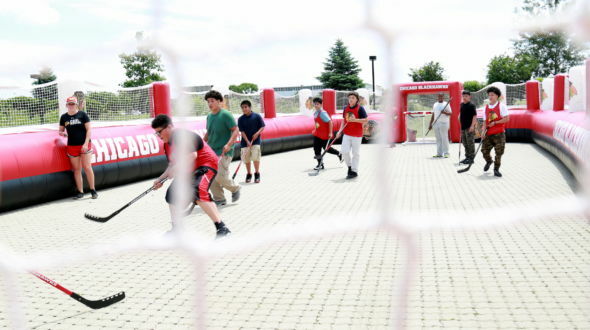 The Blackhawks brought their giant inflatable rink for middle schoolers to get competitive with each other playing field hockey. Girls in the Game hosted the “Girls Sports Zone” where kids could complete a physical activity challenge. 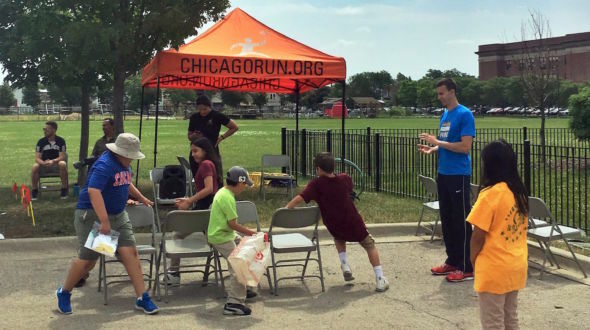 Chicago Run hosted the musical chairs station, infused with their unique ideas for creative movement. 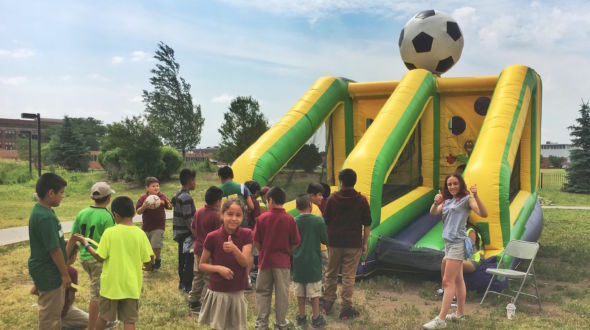 Urban Initiatives staged a soccer shoot-out game where kids could show off the skills they had been working on all year. Sports, physical fitness, and teamwork can help schools and students succeed. Far from competing with one another, organizations that provide sports-based youth development programs are strengthened by common purpose. When a school (especially a big one like Prieto!) works with many like-minded organizations, everyone’s work is enhanced and our capacity to inform healthy school cultures is more impactful. Thanks to all the organizations as well as all the school staff who helped make a fun, active field day possible at Prieto!